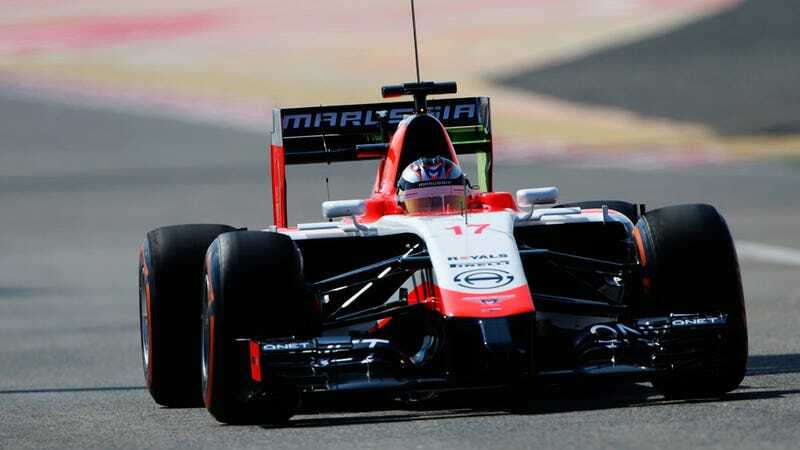 Formula 1 team Marussia lost a day's worth of vital on-track testing after its servers were struck with a computer virus. So what would it take to hack their car? Autosport reports that the trojan virus knocked the team out for its first day of Bahrain testing last week. Here's the whole quote that Marussia's team principal John Booth told Autosport. It started off with the first disaster, which was a computer Trojan-type virus in the racks, which cost us the best part of the day. Much to my dismay, this means that the car itself was not hit with a virus, which (as far as I can tell) would have been the first admitted example of a car being hacked outside of conspiracy theories or test circumstances. So this leaves us with the question — could someone hack an F1 car? F1 cars are regularly hooked up to computers for programming and analysis. This incident with Marussia was just a regular server virus that just so happened to hit an F1 team, but getting a virus into the car when it's in the pits certainly appears feasible. What would be a real innovation would be if an F1 car could be hacked while it was on track. There's reason for teams to do it — a small counter-adjustment to fuel flow or any other of the car's many electronic systems could ruin a rival team's race. F1 teams are known for fighting dirty, and I wouldn't be surprised if car hacking happened in the sport. It's not clear how, exactly, an F1 car would be hacked while on the move. F1 cars certainly transmit data back to the pits for every kind of digital function, now even including brake-by-wire systems. What I don't know about is how much data goes from the pits back to the car. All modifications to the car while it's on track are done by the driver, not from the pits. That's why you see such complicated steering wheels - they're the keyboards of the car. If you have more insight in what it would take to hack an F1 car, please let us know below.